Brigham and Women's Hospital Resident Dr. Daniel Yazdi outlines the benefits for doctors, patients and digital health disease management programs. About the Author: Dr. Daniel Yazdi is an Internal Medicine Resident at Brigham and Women’s Hospital/Harvard Medical School interested in the intersection of digital health and clinical medicine. He can be followed on Twitter @DanielYazdi. Watch-ing your blood pressure, pun intended, is about to have a new meaning. 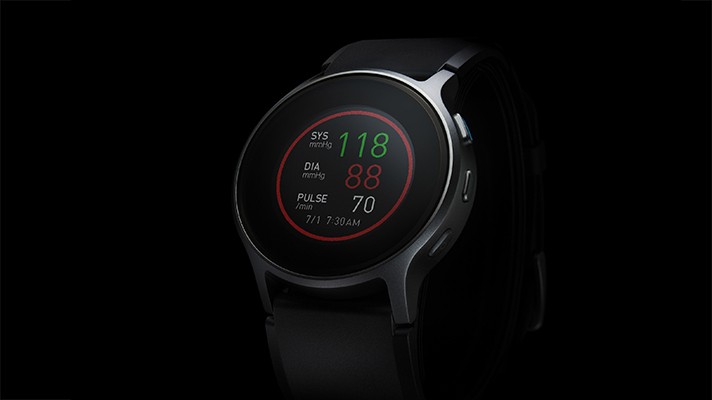 Early 2019 marks the release of the first FDA-approved smartwatch blood pressure cuff. Why is this big news? Hypertension affects about 75 million Americans, one out of three adults. It is the leading cause of cardiovascular disease (heart attacks and strokes), resulting in about 1,000 deaths per day. Only 50 percent of patients have their blood pressure adequately managed, demanding a better solution. The watch, HeartGuide, will be released by Omron. It measures blood pressure by inflating the wrist band; a mechanism similar to that of a traditional cuff. Apple also submitted a patent in June 2018 for a similar device, so we may see similar features in the next iteration of the Apple Watch. To appreciate the benefit of a device like this, we need to understand the current limitations of hypertension management: 1) infrequent measurements 2) inherent data variability 3) white coat hypertension 4) non-compliance 5) poor patient-provider follow-up. A smartwatch blood pressure monitor will solve each of these. A majority of patients have their blood pressure measured only during clinic visits — one to five times per year. In comparison, a watch that takes 10 measurements per day will have 3,640 measurements per year. This allows for a new level of granularity and accuracy of measurements. Each user will have an average sleeping, resting and awake, and activity blood pressure. A device like this has the potential to measure orthostatic hypotension (when the blood pressure drops upon standing), commonly caused by dehydration and a leading cause of falls in the elderly population. With more continuous measurements, patients and physicians can work together to identify the onset and progression of hypertension before it causes irreversible damage to the heart, kidneys and brain. There will be direct feedback for users about factors that elevate their blood pressure. For example, a salty lunch, a stressful business meeting or too many alcoholic beverages may be shortly followed with a blood pressure warning on the watch. With this feedback, users will have more control over their disease. At the doctor’s office, blood pressure should be measured after five minutes of rest. This is rarely the case. When I see patients in clinic, their triage blood pressure is usually elevated because they were recently walking frantically to be on time. At the end or our appointment when the patient has been sitting for over five minutes a blood pressure recheck is often within normal limits. A smartwatch can circumvent this problem since the activity tracker can automatically identify periods of rest. Next, there is a very real phenomenon called white coat hypertension — when a patient’s blood pressure is elevated in front of a healthcare provider due to anxiety. My grandmother, for example, has a blood pressure of 120/70 mmHg at home, but a value of 190/90 in the anxiety-provoking clinic. A passive smartwatch sensor mitigates this effect and allows for more accurate treatment of hypertension, or lack-thereof. Which brings me to my next point, ease of use. Convenience is king. Given the passive nature of the recording (does not require user initiation), compliance rates for home blood pressure measurements will dramatically rise. This is the holy grail for digital health devices. Historically, digital health product compliance is initially high but drops off precipitously due to poor user follow through. This Harvard Business Review article by Robert Huckman and Ariel Stern highlights why chronic disease management with mobile applications has been so difficult. Finally, this will allow for better patient-physician follow-up. When a patient comes to their routine clinic visit, the data can be viewed on their phone and/or ideally synced with the EHR to allow for easy visualization of the data. Very soon, chronic disease management programs with nurse practitioners or health care navigators will manage a patient’s blood pressure virtually using this data, decentralizing healthcare delivery to the home. In the not so distant future, natural language processing tools, like Google’s Duplex or Apple’s Siri, can potentially manage hypertension without the direct need for a human medical provider. Digital health may be living up to the pressure by helping us control this lethal disease.